Message on a Friday:Enjoy your life and sock style! It's been a while since I've posted a "message" on a Friday, but this fun image was taken when we were in Kyoto,Japan. 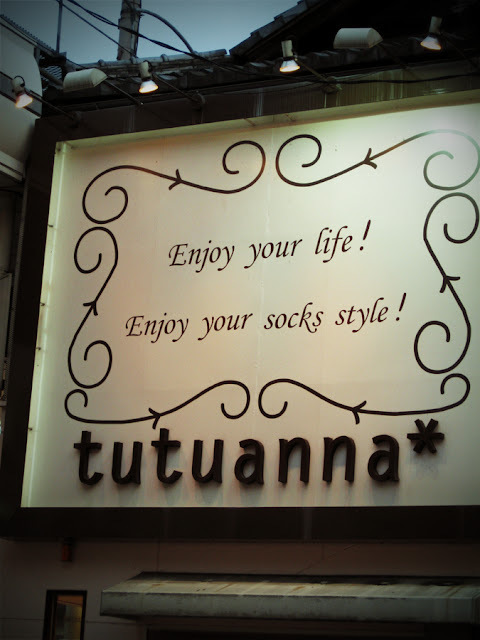 Hey, it's a simple message that got me thinkin' about my socks...Why not enjoy those pair of socks you're wearing? They're hardworking and keep our feet warm and protected as we move along our daily life. It's been a never-ending "sandal-wearing" season here at home, but it's finally coolin' off that I want to wear my favorite pair of socks. Ok, I admit I'm a plain white ankle-sock wearin' kind of girl (Adidas socks anyone?). Basic,sporty and comfy-what's not to love? But my hamper or washing machine is like a bottomless pit that just swallows up socks, because somehow I'm always missing one. Mismatched socks days ahead... So I can't help but browse around and love the designs that are out there right now from the following labels from Sweden, Japan or my hometown of LA. Colorful, playful, lighthearted and just plain fun...these socks may just add some pep in your step. What's your sock style? Anklet, crew socks or knee high? White, color blocks, prints or maybe even those warm REI socks?